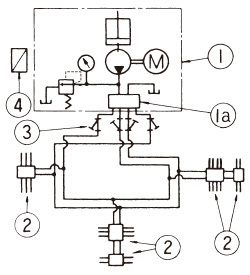 Motor Driven Loop Type System | Overview | Daikin Lubrication Products & Engineering Co., Ltd.
• Reliable operation with few failures as switching is performed directly by the return pressure. • Suited to installations where lubrication points are relatively centralized. • Low electrical wiring costs as electrical wiring is grouped together at the pump. • Convenient for maintenance and inspection as pressure can be adjusted on the pump. Automatic operation is performed based on the lubrication interval set by the system timer on the electric control panel (4). In addition to the “Tank Empty” and “Overload operation” alarms, “Oil feed time extension” alarm is displayed to indicate an abnormal lubrication state by the signal timer. The signal timer is set to roughly twice the completion time of lubrication operation. The solenoid hydraulic operating valve (1a) has two functions, to alternately switch the two main supply lines, and to guide the return pressure of the main supply line to the pressure switch. 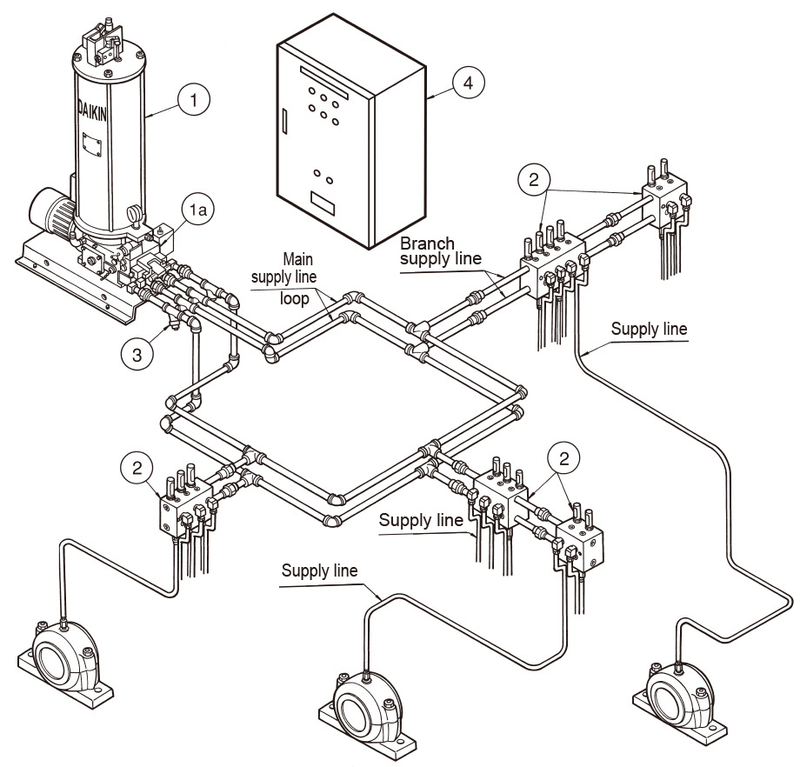 When the distributing valve (2) operates and all lubrication to the lubricating parts is completed, the pressure of the main supply line rises. When this pressure reaches the preset switching pressure, the pressure switch operates to send a signal to the electric control panel (4) and stop the pump (1). At the same time, the pressure in the piping is released to the tank. After a fixed time has elapsed, the system timer is activated to start lubrication by the main supply line on the opposite side. Note) The UE series and U-5AL type motor driven grease pump operate by a mechanical type hydraulic operating valve system.